The story of KISS: The Band is one of a band that was every bit as much about the marketing as the music. From a revolving door of band members to crazy merchandise ideas (KISS Kaskets, anyone?) - and of course, make-up - KISS managed to become one of the biggest names in rock in a very unusual way: fans were borderline disinterested in their studio albums but they still manage to sell out arenas live. 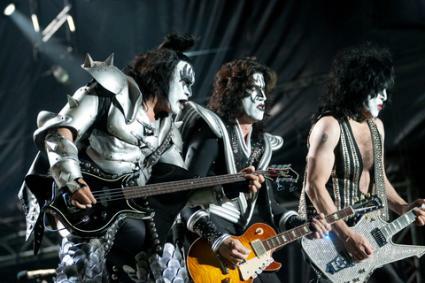 KISS traces their roots back to early 1970s New York City and a band called Wicked Lester. That band was formed by Gene Simmons and Paul Stanley, who would go on to become the creative team and only stable unit in KISS. Wicked Lester got a deal with Epic and recorded an album, but the label didn't make them a priority and never got around to releasing it. Frustrated with the road Wicked Lester was on, Simmons and Stanley decided to scrap the whole thing and start fresh. After spotting an ad in Rolling Stone magazine from Peter Criss, a drummer in search of a band, they called him and started playing as a three piece. Ace Frehley, guitarist, was eventually hired to round out the group. The band renamed themselves KISS and hit the local club circuit in early 1973. Around that time, two important things happened. First, glam music was gaining popularity, which inspired KISS to experiment with make-up. Next, they hired a manager, Bill Aucoin. Aucoin was signed to a two week contract - if he didn't find the band a deal in that time, he was fired. Aucoin came through with a deal from Buddha Records, which soon after signing KISS changed their name to Casablanca. The band wore full faces of black and white make-up in a design that was in keeping with their character. The band's first self-titled release came out in February 1974. The label launched a massive touring and PR campaign for the band. They appeared on many TV shows and toured all over the U.S. and Canada, but the album was failing to sell. The label was hemorrhaging money and demanded that the band hurry into the studio to record a follow-up in October 1974. This album, Hotter Than Hell, was equally disappointing in terms of sales and failed to break into the Top 100, despite receiving the same full-on promotional campaign. Again, the band was pulled into the studio - this time in March 1975. The resulting release, Dressed to Kill, marked a change in direction for the band musically. The sound was less metal and more pop. The change didn't do much to increase sales, though this album does contain the song that would go on to be their best known track: Rock and Roll All Nite. Although KISS was far from burning up the sales charts, the band was developing a huge live following. News of the band's stage show - which included Simmons "breathing fire" and spitting up "blood" (yogurt with food coloring) - gained attention, and the band was selling out arenas while hardly selling any records. A double live album changed their sales fortunes. Alive and Alive II saved their label from bankruptcy and went gold. They followed with studio album Destroyer, which entered the charts briefly, but failed to achieve the sales of the live albums. A performance on the 1976 Paul Lynde Halloween Special was an introduction to a national, mainstream audience of the KISS live experience. The show also had a significant young audience. The success of this show sent the fanbase through the roof, but also changed the demographic of the fans. Pandering to this new audience created tension in the group. Strangely, KISS was contractually obligated to have each member simultaneously release a solo album, which they did in 1978. The albums bombed but increased tension that was already brewing in the group. The first problem was Frehley's and Criss' alcohol and drug abuse. Criss became unable to perform live and embarrassed the group during TV and radio interviews and was asked to leave the band in 1980. KISS began to pander to a younger audience, who would attend their shows in full make-up with their parents. They went in a poppier direction with their music and appeared on Saturday morning kids' TV programming. Frehley did not approve of the new direction and left the band over creative differences in 1982. During the 1980s, Simmons, Stanley and a revolving door of Frehley and Criss replacements took off the make-up and had a modicum of success. By the late 1980s, however, KISS was essentially on the back burner. In 1996, the four original members of the band reunited and made their debut performance on that year's Grammy show. They hit the road and had the highest grossing tour of 1996. By 2001, the tensions were back and by 2004, the whole thing had fallen apart again. After a hiatus, Simmons and Stanley announced plans for a new KISS album in 2009.